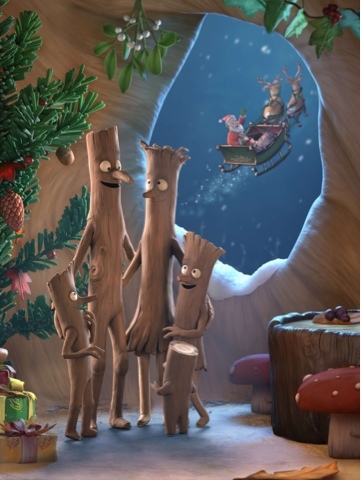 Magic Light Pictures, the Oscar-nominated entertainment company, will be bringing the much-loved children’s picture book Stick Man to the screen this Christmas as a festive highlight on BBC One. Written in 2008 by Julia Donaldson and illustrated by Axel Scheffler, creators of the modern classic The Gruffalo, this heart warming animated special will be voiced by a stellar cast of British acting talent - Martin Freeman as Stick Man, Hugh Bonneville as Santa, Jennifer Saunders as the narrator, with Russell Tovey, Rob Brydon and Oscar nominee Sally Hawkins completing this all star cast. "Stick Man lives in the family tree with his Stick Lady Love and their stick children three." Join Stick Man on an epic adventure across the seasons as he’s taken further and further from home, as he runs from a playful dog, gets thrown in a river, escapes from a swan’s nest and even ends up on top of a fire. Will he get back to his family in time for Christmas? First published by Alison Green Books, an imprint of Scholastic Children’s Books, Stick Man is Magic Light’s fourth adaptation of a book from the UK’s bestselling picture book team. Room on the Broom, which premiered on BBC One Christmas 2012, received a 2014 Oscar nomination and won a BAFTA, an International Emmy and an RTS Award. Previously, Magic Light produced The Gruffalo and The Gruffalo’s Child, with the former winning over 15 awards as well as nominations for an Oscar, a BAFTA and the Cartoon D’Or and delivered audiences of 10 million to BBC One for their respective Christmas Day transmissions. Stick Man (1x30’) is a Magic Light Pictures production acquired for BBC One by Polly Hill, Controller of Drama. Directed by London-based Jeroen Jaspaert, co-directed by Daniel Snaddon, and produced by Michael Rose and Martin Pope, the animation has been created at Triggerfish Animation Studios in Cape Town.